This is just the third part of the items I received from Loving Naturals. I received a TON of items for review and this review is for Sunscreen! I really love this lip balm. 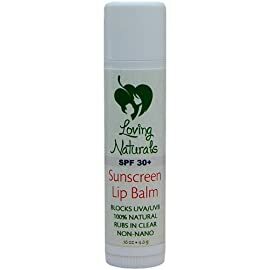 I wear lip balm all year long constantly and it's a bonus if it's SPF30 because I know my lips are protected! I'm saving the sunscreen stick until baby gets here... It's easier to use on a baby so you're not dealing with cream that can burn the eyes and I think it will be great to keep in the diaper bag for when it's needed. The Clear Face Sunscreen is GREAT!! My face and my shoulders are the only area on my body to get burned and even though my moisturizer has SPF15 in it already sometimes that's just not enough. I love this clear sunscreen. It truly goes on clear and it has no smell to it so it doesn't have that overpowering sunscreen scent and it's just mild on my acne and eczema prone face. The baby sunscreen is great too. I have used it on Avery a couple times and so far so good. She hasn't even gotten pink with this sunscreen on and she's so sensitive that she actually gets burned sitting in the car, so it's great that just an SPF30 is all we need to protect her! Again not much of a scent, so it doesn't affect our eczema! Price: The Lip Balm is $4.99, Clear Face in the size I received is $12.99. The Stick is $10.99 and the baby sunscreen is $21.99 for 4.3oz. I'm pretty happy with these prices. They are competitive! I like Loving Naturals on FB. I like Loving Naturals on FB as Whitney Lindeman.